Winter / Storm prep tips. 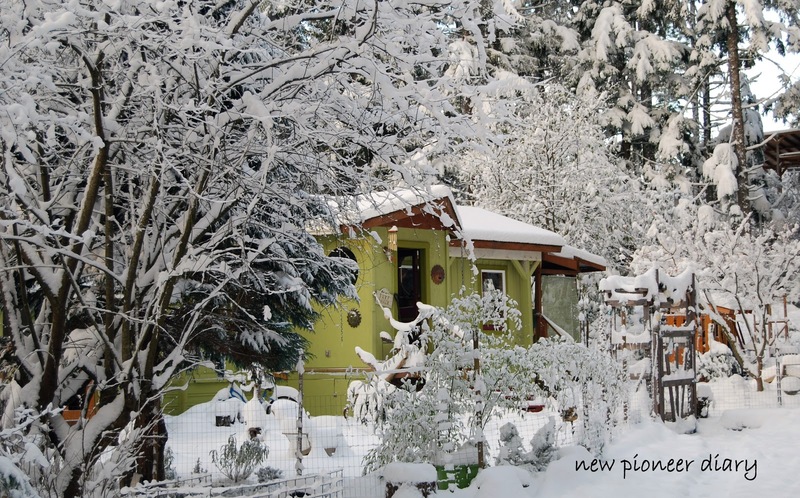 While it's a little early to be thinking about snow here in the Pacific Northwest, it is not too early to prepare for it! Women on their own must look out for themselves and be prepared for anything - because anything can happen. I have been through many major storms here and been trapped for weeks, both at home and away from home. I now have a preparation ritual. In the Fall (sometimes sooner) I start thinking about what I need to do, from gathering supplies to making preparations. Supplies always include extra canned and dry goods, anything I can cook or prepare on a camp stove should the power be out. Preparations include winterizing the house. Wrapping outside pipes, putting up heavier curtains inside. I even pack an overnight bag that I keep in my car should I get stuck away from home. 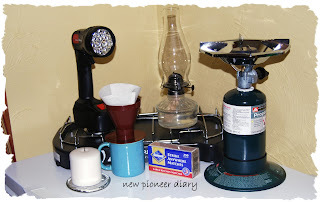 I always make sure I have a flashlight and extra batteries, several small propane tanks, lanterns and oil, matches and ground coffee! Until they design a battery operated coffee grinder, this is a staple for me! Of course a small drip coffee one-cupper and cone shaped filters must be included. Other useful things would be a couple of bags of ice in the freezer, so when the power goes out it keeps the food cold. One year it was so cold outside that I just put the food out there. Extra containers of water may be necessary if your water comes from an electric pump, and did I mention candles? Lots of them. Obviously I have a back up heating system that doesn't require electricity. I have a wonderful wood stove. It is actually my primary heat source. I get my fire wood in the summer, stacked, cured and covered by Sept.
Keep the gas tank full in the car and the snow shovel by the front door. Have a corded phone to plug in to the jack should the power go out. Cordless phones are useless without power. Up until about a year ago I didn't even have a cell phone, but now that I do, I keep that charged up. While I don't get service here at my house, at least I can use it in the car if need be. So these are some of the things we can do to be prepared for a long winter living alone. If you're on a budget like me, or just like to conserve your resources, we have to think outside of the box a little more, get creative and work with the resources you have. I'm really quite content with my independent life, and grateful to have a sharp mind and willing spirit. It just makes life so much more interesting. If you have any tips you'd like to share on winter preparedness, please leave a comment! I look forward to hearing from you. Jennifer thanks so much for the tip on taking non perishable food in the car! Sometimes out here we have to wait while they clear debris from the road, so that's a great idea. Maybe that's another blog post for more ideas on what to keep in the car! I welcome your comments! Links to your blog welcome. Spam links will be deleted. Follow J Gray Design's board Huckleberry Hollow on Pinterest. All Images Copyright J Gray 2008 - 2019 All Rights Reserved. Awesome Inc. theme. Powered by Blogger.